Public Works Dept and Medical Services of Chhattisgarh State. Eligible candidates can apply online for this CG VYAPAM Sub Engineer Civil Jobs @cgvyapam.choice.gov.in from 23-12-2018 to 13-01-2019. Selection process for Chhattisgarh Vyapam Sub Engineer (Civil) Jobs vacancy of CG PWD Recruitment 2018 will be through written test only. Online applications will be accepted through CG Vyapam official website only, no other mode of applications are going accepted for this CG VYAPAM Sub Engineer Recruitment Exam 2018. For more information about Chhattisgarh Nagar Palika Nigam, Nagar Parishad Nigam vacancies Sub Engineer Civil Jobs recruitment exam pattern, exam syllabus, salary, online application form submission procedure, age limits, qualifications, exam date, admit card release and more details given below. There are total 139 vacancies available in Chhattisgarh Vyapam Nagar Palika Nigam, Nagar Parishad Nigam and Nagar Panchayat recruitment 2018. Department wise and Category wise vacancies are given below. The candidate should have qualified 10+2/intermediate examination and diploma in civil /electrical /mechanical engineering or A bachelors degree of B.E/B.Tech in Civil/Electrical/Mechanical Engineering. The candidate's age limits as on 1st January 2018 for General 21-35 years. Age relaxations are applicable as per the government norms of Chhattisgarh State. Selection for this CG VYAPAM Upa Abhiyanta (Civil) recruitment is held in two stages. Written Exam will be conducted for 150 marks. Details will be updated soon. 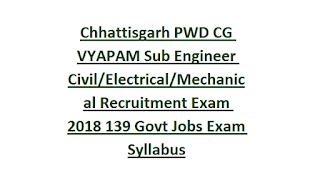 Candidates who are having Engineering diploma or Graduation they can apply online for these CG Vyapam SE Civil jobs on or before the closing date of 13-01-2019 through official website of www.cgvyapam.choice.gov.in. Written Exam admit card release date, exam results, exam syllabus and other details are available in this website only. Download the exam syllabus in PDF format which is given above. PWD Dept Notification of Chhattisgarh Vyapam Sub Engineer (Upa Abhiyanta-Civil)Recruitment 2018. 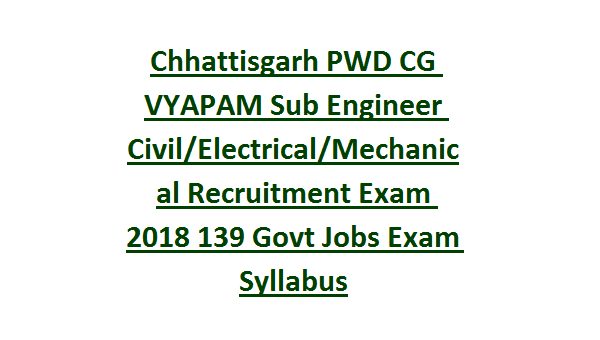 Please share this CG VYAPAM Sub Engineer (Civil/Electrical/Mechanical) Recruitment 2018 article to your lovable friends through online via social web. Previous papers any for this.